When creating a Facebook ad, it can take hours to tweak your target audience to make sure that your ad reaches those who will most likely click it. Even after you have created your target audience, you still cannot be sure how your audience will react to your latest ad. 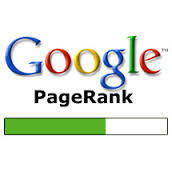 What better a way to set a target audience than one based on the likes/disklikes of your current clients? 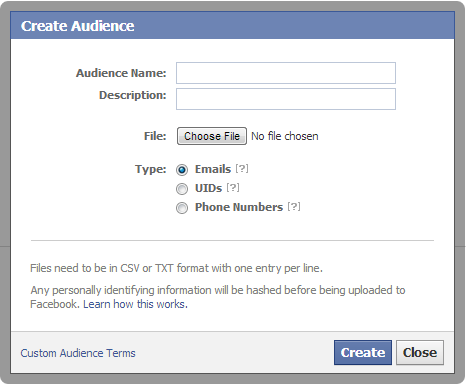 Enter Facebook Custom Audiences and Lookalike Audiences. 1. 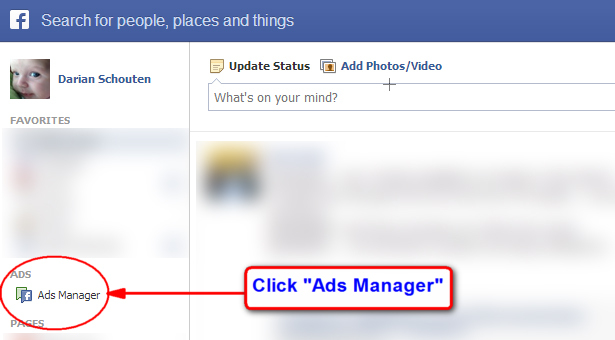 While using a desktop to browse Facebook, click the, “Ads Manager” link in the left column. Note: This will be called, “Adverts Manager: if you are not using Facebook Graph Search yet. 2. 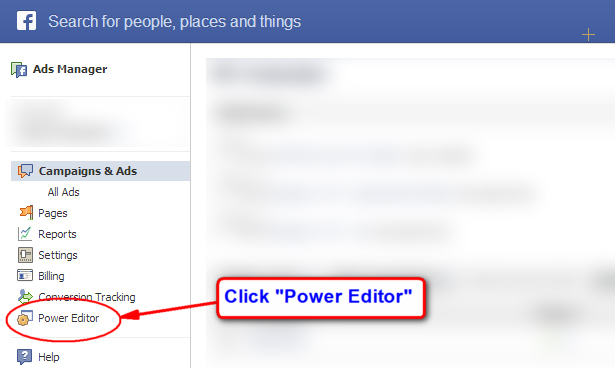 Once inside the Facebook Ads Manager, click “Power Editor” on the left. 3. Once inside the Power Editor, highlight the, “Audience” tab in the left-hand menu. 4. While looking at the “Audiences” screen of the Power Editor, Click the “Create Audience” drop-down and select “Custom Audience”. 5. After agreeing to Facebook’s Custom Audience Terms, you will be presented with the following screen where you can name your aidence, give it a descrition and tell Facebook what type of data you will be uploaded (Email Addresses, User ID’s or Phone Numbers). Whatever option you choose, the files must be in CSV or TXT format with one entry per line. After completing the form and choosing your file to upload, click “Create”. Congratulations, you have just created your first Facebook Custom Audience! Read On to learn how to create a Lookalike Audience from that new Custom Audience. 1. Make sure that you have first created a Custom Audience (see above). 2. With your Custom Audience highlighted in the Power Editor, click the “Create Similar Audience” button at the bottom of the screen. 3. After clicking, you will be taken to the Similar Audience Setup Dialog where you can choose between optimizing your audience for Similarity or Reach. 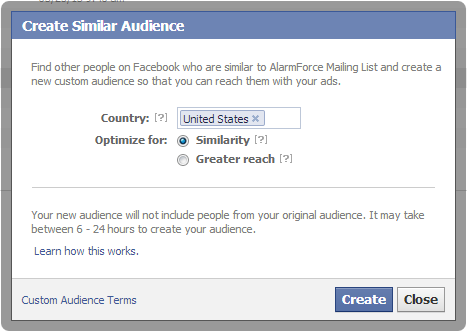 Similarity – When you choose “Similarity”, Facebook will search for users who are similar to your custom audience. Your new custom audience will not be as big as if you chose reach, but the match to your custom audience will be more precise. Reach – When you choose “Reach”, Facebook will find users who are similar to your custom audience, but not as precise. This will yield a larger lookalike audience. 4. Hit “Create” at the bottom of the box and you’re done. 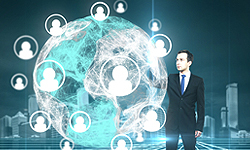 Facebook will begin to scour its user database to assemble your new Lookalike audience. This process can take anywhere from 6 to 24 hours. 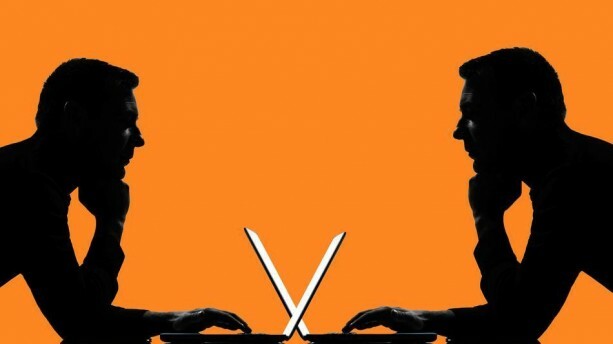 Using your client email list to create custom audiences and then expanding them into lookalike audiences is a great way to engage potential customers who are similar to people who already use your product. This is another way that Facebook is evolving its ads platform and helping advertisers to make the most of their advertising dollars. Thanks for reading! this is a great post Darian, thanks. I have a quick question. I got banned from Facebook Ads early 2013 for reasons unknown (I was following their terms and not promoting anything illegal etc). I know Facebook Ads is a great platform, can you advise on how I would get back on it? Thanks for this, I have used FB ad’s before but only on a basic level. Next time I will be able to target people a little better. I also found just changing the image that goes out with your ad can really increase the click-through rate. It is amazing how much people are drawn to the right image. I am glad that you are finding this article useful. Facebook advertising can be so easy to use, but difficult to master. I will continue to add step-by-step guides like this in order to make Facebook advertising as easy as possible! A good step-by-step guide to setting up Facebook ads. Although I have heard that FB ads meet with a lot of success, I think newbies like me should avoid using paid advertising until we start to make constant income with free methods like social media submissions. Aww, thanks for your post! I’m the type of person that only understands things through very detailed description and this is exactly that. Not to mention I am known to have a bit of a short attention span, so the picture diagrams were much appreciated. 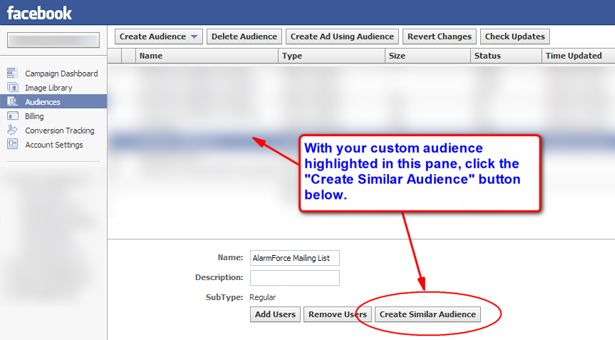 I had no idea it was this easy to create a custom audience for my FB Ad. This information will be a big help for when I get things rolling. I haven’t tried using Facebook Ads, I tried it once, but gave up eventually, I don’t know if I click the right menu or chose the right option. After reading this, I’ll try it again. I hope I can get it right now. This article would be my guide. Thanks a lot! I really love this post on Facebook ads. I was very confused about doing the custom audience and setting things up. Thanks for making this post and tutorial. It really helped me out a lot!